Victoria was queen of Great Britain and Ireland from 1837 to 1901 and empress of India from 1876 to 1901. During her reign, England grew into an empire of 4 million square miles and 124 million people. As queen, she saw slavery end in the colonies, saw her country undertake successful wars in the Crimea, Egypt, the Sudan, and South Africa, acquired the Suez Canal, and established constitutions in Australia and Canada. 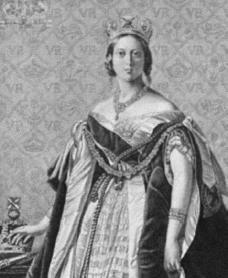 Alexandrina Victoria was born in Kensington Palace, London, on May 24, 1819. She was the only child of Edward, Duke of Kent (1767–1820), by Mary Louis Victoria (1786–1861). Her father died when she was very young and her early years were disrupted by family arguments. She grew up under her mother's care and that of Louisa Lehzen, her German governess. The education Victoria received from Lehzen was limited, and she spoke only German until she was three years old. From 1832 Victoria's mother took her on extended tours through England. On May 24, 1837, she came of age, and on June 20, after the death of her uncle William IV (1765–1837), she inherited the throne. Her chief advisers at first were Prime Minister Lord Melbourne, a Whig (or a member of the liberal political party), and Baron Stockmar, a German sent to London by her uncle King Leopold of the Belgians as adviser to his eighteen-year-old niece. On June 28, 1838, her coronation (crowning ceremony) took place. In October her first cousin Albert Edward (1819–1861) of Saxe-Coburg-Gotha, came to London. Victoria fell in love with him instantly, proposed to him, and they were married on February 10, 1840. It was a happy marriage and restored the influence of the Crown, which had weakened during the reigns of those that ruled before her. Prince Albert was granted a thirty-thousand-pound annual income by Parliament, the governing body of Great Britain. He also was named regent (acting ruler) in the event of the queen's death in childbirth, and in 1857 was made Prince Consort by Victoria. In June 1842 Victoria made her first railway journey from Slough, the station nearest Windsor Castle, to Paddington, and in that same year she first went to Scotland, traveling by sea. In 1843 Victoria and Albert visited King Louis Philippe (1773–c.1850). She was the first English monarch to land in France since Henry VIII (1491–1547) visited Francis I (1494–1547) in 1520. King Louis Philippe's return visit was the first voluntary visit to England of any French ruler. In 1845 Victoria, with Albert, made the first of many trips to Germany, staying at Albert's birthplace, Rosenau. In 1844 Queen Victoria had Osborne Palace built for her on the Isle of Wight and in 1848 Balmoral Castle in Scotland. Until the end of her life she spent part of each spring and fall in these places. In 1851 she and Prince Albert were much occupied with the Great Exhibition, a world's fair held in London and the first of its kind. In 1856 Victoria and Albert visited Napoleon III (1808–1873) in Paris, and in 1857 the Indian Mutiny against British rule in India led to Victoria's writing that there now existed in England "a universal feeling that India [should] belong to me." In 1858 the British charter that opened trade with Asia, known as the East India Company, was dismantled. That same year Victoria's eldest child, Victoria, married Prince (later Emperor) Frederick of Prussia (today known as Germany). In March 1861 Victoria's mother died, and her eldest son, Albert Edward, while in camp in the Curragh in Ireland, had an affair with an actress called Nelly Clifden. The affair worried Victoria and Albert, who were planning his marriage to Princess Alexandra of Denmark. Meanwhile, Albert was suffering from typhoid fever, a terrible disease that causes fever and other symptoms and is easily spread, and died on December 14, 1861, at the age of forty-two. In 1862 Victoria's daughter Alice married Prince Louis of Hesse, and a year later her eldest son, the Prince of Wales, married Princess Alexandra of Denmark. Victoria supported Prussia during its war with Denmark over Schleswig-Holstein (a state in northwest Germany) and she approved Russia's brutal crushing of Poland's national uprising in 1863. In 1865 in the Seven Weeks War between Prussia and Austria, Victoria was again pro-Prussian. In 1867 Victoria entertained the Khedive of Egypt and the Sultan of Turkey. In the Franco-Prussian War of 1870 between France and Prussia, Victoria was still pro-Prussian, though she welcomed the French empress Eugénie and allowed her and the emperor to live at Chislehurst. In 1873 Prime Minister William Gladstone (1809–1898) resigned, and in 1874, to Victoria's delight, Benjamin Disraeli (1804–1881) became prime minister, the chief advisor to the throne. He called the plump, tiny queen "The Faery" and admitted he loved her. That same year Victoria's son Prince Alfred married Marie, daughter of the Russian czar (king), who insisted she be called "Imperial," not "Royal Highness." This encouraged Victoria to look into officially assuming the title "Empress of India," which she did on May 1, 1876. In 1875 Disraeli bought the majority of the Suez Canal, a key waterway for trade in the Mediterranean Sea, from the bankrupt Khedive of Egypt. That same year Gladstone roused the country with stories of "Bulgarian atrocities" where twelve thousand Bulgarian Christians had been murdered by the Turks. In 1877 Russia declared war on Turkey; Victoria and Disraeli were pro-Turk, sending a private warning to the czar of Russia that, were he to advance, Britain would join in the fight against Russia. In 1878 at the Congress of Berlin, Disraeli obtained, as he told Victoria, "peace with honour." In 1887 Victoria's golden jubilee (fifty years in power) was celebrated, and ten years later, her diamond jubilee (sixty years in power) was magnificently celebrated. In 1899 the Boer War broke out, where British soldiers fought against Dutch forces in South Africa. In 1900 Victoria went to Ireland, where most of the soldiers who fought on the British side were recruited. In August she signed the Australian Commonwealth Bill, bringing Australia in the British Empire, and in October lost a grandson in the war. On January 22, 1901, Queen Victoria died. At sixty-three years, Queen Victoria enjoyed the longest reign in British history. During her reign the British crown was no longer powerful but remained very influential. The Victorian age witnessed the birth of the modern world through industry, scientific discovery, and the expansion of the British empire. Her reign also witnessed the beginnings of pollution, unemployment, and other problems that would plague the twentieth century. Erickson, Carolly. Her Little Majesty: The Life of Queen Victoria. New York: Simon & Schuster, 1997. Hibbert, Christopher. Queen Victoria: A Personal History. New York: Basic Books, 2000. Rennell, Tony. Last Days of Glory: The Death of Queen Victoria. New York: Viking, 2000. Vallone, Lynne. Becoming Victoria. New Haven, CT: Yale University Press, 2001. Weintraub, Stanley. Victoria: An Intimate Biography. New York: Dutton, 1987.